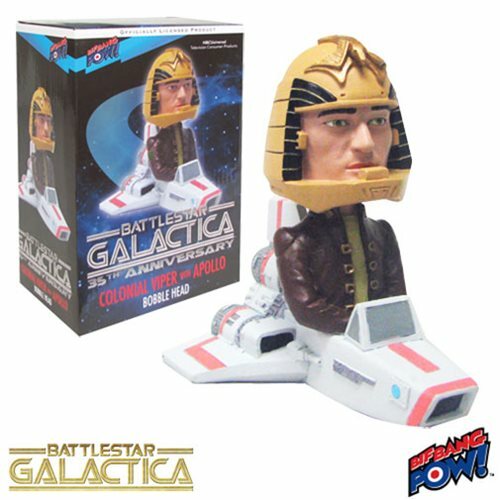 Shopping for Battlestar Galactica Bobble Heads? Limited Quantities Back in Stock! Now honestly, isn't this one very cool bobble head? Captain Apollo sallies forth in his Colonial Viper! Collect the entire Battlestar Galactica crew... and their adversaries! New warehouse find! Limited quantities are back in stock - just in time for the holidays! Hot on the trail! Bif Bang Pow! presents an exciting array of resin bobble heads inspired by the ever-popular sci-fi TV series Battlestar Galactica. In 7-inch scale, each bobbler spotlights a key character from the show, be they gallant hero or malevolent villain. The intrepid Captain Apollo, played by actor Richard Hatch, is featured here in his Colonial Viper, hot on the trail of those nasty Cylons. Measuring about 6 3/4-inches long x 5 1/2-inches tall x 4 3/4-inches wide, this is one very cool bobble head. Order Captain Apollo now and collect the entire Galactica crew... and their adversaries! Battlestar Galactica (BSG) is an immensely popular franchise of television series and sci-fi films, the first of which aired in 1978. Books, comic books, and video games followed. In Battlestar Galactica, The Twelve Colonies - a civilization of human beings in a far-off sector of the universe - are at war with the cybernetic Cylons. The Cylons lay waste to The Colonies, decimating their worlds and populations, and the survivors flee aboard any spacecraft they can find, including the Battlestar Galactica, the only military ship in the Colonial Fleet to survive the Cylon attack. Battlestar Galactica's renowned commander and his crew then lead the ragtag flotilla of survivors in search of a new home, the mythical planet Earth. Ages 14 and up.